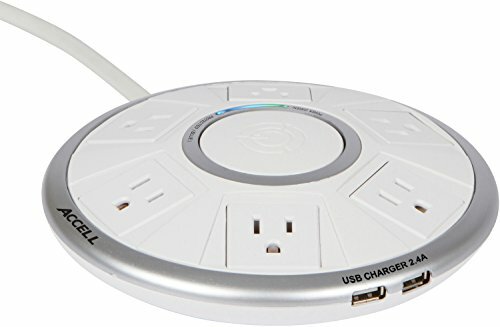 The Powramid Air Power Center and USB Charging Station features 6 adapter-spaced outlets, providing full access to all 6 power outlets - regardless of plug/power adapter size and shape. The two USB charging ports feature smart chip technology to optimize the 2.4A of surge-protected charging to USB-powered devices (e.g. mobile phones, tablets, portable music players). The practical, convenient design is sleek and round, perfect for placement on a desk or conference room table. If you have any questions about this product by Accell, contact us by completing and submitting the form below. If you are looking for a specif part number, please include it with your message.